Plastic Molded Concepts (PMC), a plastic injection molding company in Eagle, WI, has installed a Sawyer robot from Rethink Robotics to drive business growth and offer high-quality jobs for workers. PMC has turned to automation to boost the efficiency of its 38 molding machines ranging from 28 to 1,100 tons. Currently, Sawyer is deployed on a molding press that is making parts for a pressure gauge. Sawyer picks a part from the press and puts it on a computer numerical control (CNC) machine for a hole drilling operation. When Sawyer detects that the part is finished, the robot places the part in a box. Sawyer waits until there are exactly 160 parts in the box, then pauses for an operator to pick up the box. The operator then pushes Sawyer’s signal to continue the process for the next box. “We qualify our success in terms of efficiency, and there’s no better solution to efficiency than automation,” said Larry Floyd, president of PMC. While its business continues to grow, PMC has simultaneously seen high turnover among entry-level employees. With Sawyer, PMC aims to relieve human workers of monotonous tasks so they are free to do more value-oriented and intricate work, keeping them engaged with the company longer. In making parts for pressure gauges, the robot takes on the more tedious tasks, allowing a worker to become the robot operator.PMC, founded in 1975, serves a wide range of customers in markets that include food storage packaging, beverage, aerospace and defense, electronics, filtration and medical. 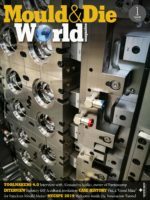 The company’s capabilities include in-mold decorating, post-molding decorating, precision machining, thermal fusion, assembly and packaging. 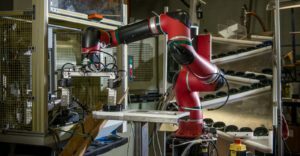 Floyd explained that while the company has many other types of automation including robotics in pick-and-place automated tasks on its presses, Sawyer is the first 7-axis robot that can work collaboratively with humans to perform higher functions at the press. “We will continue to add more of these types of robots in the future,” he added. It’s PMC’s goal to deploy more robots in the next few years, and eventually automate up to 30% of the plant’s manufacturing tasks.